Many times, we are asked by organizations why is Docsvault used or what is the purpose behind adopting Docsvault. The obvious answer is document or content management but that would be a very vague and wide term. Docsvault solves more than one purpose and based on our customer surveys and case studies, we have found that the top 10 reasons why companies adopt Docsvault are as under. Many small and medium sized organizations do not wish to have individual software and systems for individual purposes. This is why, companies that are looking for document management as well as simple or automated task or workflow management, prefer to use Docsvault. Almost 40 percent of our customers have cited automated workflow as one of the reason to use Docsvault. Paper-centric organizations such as law and insurance firms are required to store a lot of documents and need versioning for updating records and files and thereforestress on the importance of versioning and revision process. 40 out of 100 users have claimed to choose Docsvault because of its versioning and revision management features. With the introduction of web access in the Enterprise Edition of Docsvault, a major share of Small Business Edition users switched to the new edition touting web access as their preferred feature. Almost 30 percent of our customers say that they cannot do without web access feature. While almost all systems come with security, Docsvault’s fine-grained security which is easy to comprehend and adopt, is one of the reasons why 35 percent of our customers find it to be one of the most necessary features of Docsvault. Once on the top of the list, today around 35 percent of users say Docsvault’s search feature meets their organizations immediate need and it is the reason why they felt the need for Docsvault in the first place. Docsvault’s Search feature brings sense to document chaos in an organization and cuts back search time by half thus improving organization’s productivity. Whether small or large, IT or Infrastructure, Trading companies or Manufacturing, 60 percent of organizations all over the world still need a stable, robust and simple document management software in their organizations to cut back turnaround time and ensure all their documents are safe and easily accessible. Around 25 percent organizations, mostly those who are spread over a number of locations chose Docsvault because besides their immediate document management security and storage needs, it also catered to their sharing needs. Docsvault offers multiple sharing features that allow organizations to share documents within and outside their organization in no time. Although document or records retention feature is still not high in demand because of lack of knowledge of retention laws, more and more organizations are asking for document retention and are choosing a solution only if it meets this criterion. Almost 15 percent of our users have specifically asked for and stated document retention as the deciding factor for choosing Docsvault. With regulatory compliance becoming stricter than ever, almost 20% of organizations said that the fact that Docsvault offers document versioning, audit trail, document retention and other features necessary for legal compliance, was why they decided to buy Docsvault. Paper centric institutions such as schools, NGOs etc. who don’t prefer to use many complex features, chose Docsvault because of its simple scanning and import feature that allows them to convert all their physical files into digital records and provide automatic backup for them. 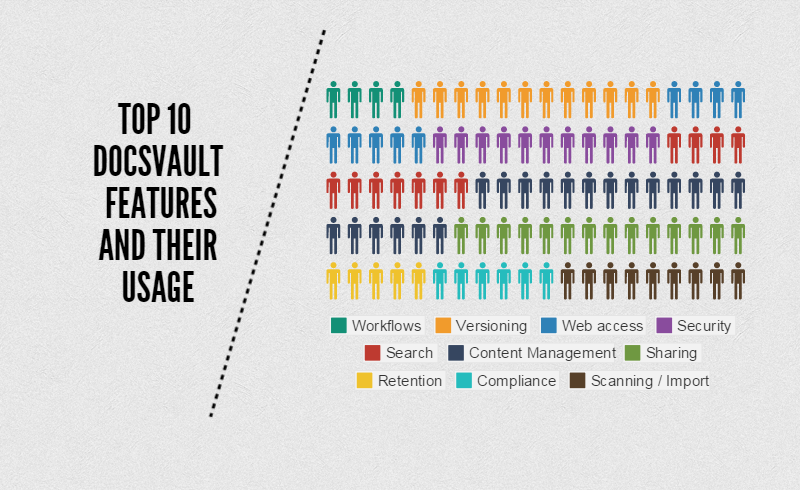 These are the top 10 reasons why organizations all over the world are choosing Docsvault. While some organizations need only one feature, most organizations like the fact that Docsvault offers a bouquet of features that meet their requirement. List down the needs and requirements of your organizations and email it to sales@docsvault.com and we will give you a step by step guide as to how Docsvault can help you meet them. Have a great day!